LITTLE ROCK – Hospitalizations due to incidents involving all-terrain vehicles declined in Arkansas between 2005-2009, according to data from the Arkansas Department of Health. However, the numbers show that people aged 19 and older, were still the most likely to wind up in the emergency room due to an ATV accident. Of the 256 ATV-related hospitalizations in 2005, 173 were for people 19 and older. Thirty-two percent of the cases included children; 13 involved children 1-9 years of age; 36 involved children ages 10-14 and 34 involved children ages 15-18. In 2009, numbers had declined 22 percent to 210 ATV hospitalizations, with 145 of those being people aged 19 and older. Ten were from ages 1-9, 22 were from children aged 10-14 and 233 involved youths aged 15-18. Males were far more likely to be involved in an ATV crash than females. In 2005, 203 males were hospitalized, versus 53 females. In 2009, the numbers had declined by 13 percent to 168 males and 42 females. 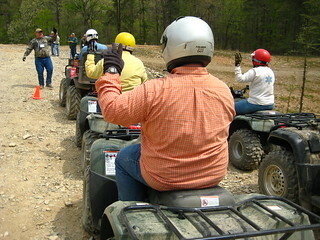 4-H, part of the University of Arkansas System Division of Agriculture’s Cooperative Extension Service, works with Arkansas Children’s Hospital’s Injury Prevention Center to ensure ATV riders learn proper and safe operation techniques. The 4-H ATV Safety Program began in June 2008 and by 2012, more than 22,000 people have heard the 4-H ATV Safety message, including nearly 700 youths and adults having taken the four-hour ASIRiderCourse and becoming certified safe riders through the Arkansas 4-H ATV Safety Program. The program has 17 instructors across the state. To find the nearest ASI RiderCourse near you contact Washburn at 501-671-2053. For more information about 4-H and other programs of the University of Arkansas Cooperative Extension Service, contact your county extension office or visit www.uaex.edu. Please note that many links to extension publications will be changing this spring as the extension service renovates its site.